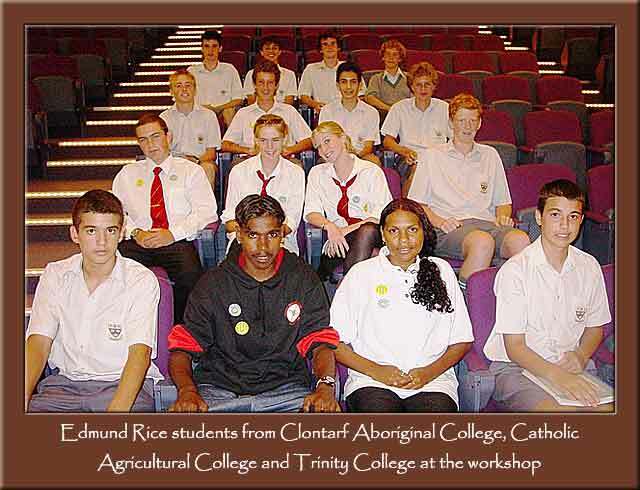 At a recent gathering of Catholic school students at John XXIII College, students from Clontarf Aboriginal College, Trinity College and Catholic Agricultural College Bindoon represented Edmund Rice schools. HE WORKSHOP was an initiative of Caritas Australia with the aim of educating our young leaders about global issues so that they could return to their schools and educate their own communities. The theme for Project Compassion this year is "The Challenge is Poverty, The Time is Now". The day consisted of working together in small groups to come up with a definition of poverty, looking at the endless cycle of poverty, as well as discussing how it might be broken. A video presentation gave an excellent account of how money raised through Project Compassion in the past has been used to help a family in Vietnam. The students were addressed by International Lenten speaker John Ashworth. John works with Caritas Australia's partners in Sudan, and he is familiar with the work of the Christian Brothers in Yambio. The students received from John a very graphic first hand insight into the daily challenges for survival in North Eastern Africa. This event provided a wonderful opportunity for our students to gain an understanding of how their support for Caritas can provide real change in our global community. Good leadership is about using the model of servant leadership which Jesus gave us - a model of leadership which leads to justice and works to end poverty.